162 pages | 238 B/W Illus. Catalysis plays a vital role in chemical, petroleum, agriculture, polymer, electronics, pharmaceutical, and other industries. Over 90 percent of chemicals originate from catalytic processes. Toughening economic and environmental constraints have proven to be a challenge for meeting the demand of novel efficient and sustainable regio- and stereoselective catalyst systems. 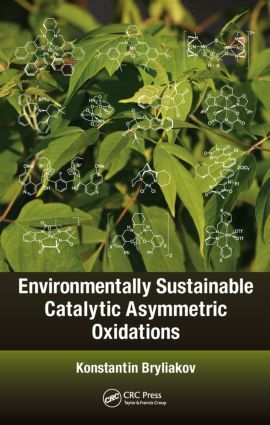 Environmentally Sustainable Catalytic Asymmetric Oxidations provides a comprehensive overview of existing ecologically friendly catalyst systems for various asymmetric oxidation processes. The book concludes with a discussion of the opportunities and problems associated with the industrial application of stereoselective processes of catalytic oxidation with H2O2 and O2. It also provides examples of processes with industrial potential. Some of the catalysts presented in this book may serve as promising alternatives for existing catalysts—progressively replacing them in manufacturing processes and ultimately making the chemical industry greener and cleaner. Konstantin P. Bryliakovwas born in Yoshkar-Ola (USSR) in 1977 and graduated from Novosibirsk State University in 1999. He earned a Cand. Chem. Sci. (PhD) in chemical physics from the Institute of Chemical Kinetics and Combustion (Novosibirsk) in 2001 under the direction of Professor E. P. Talsi. In 2008, Dr. Bryliakov was awarded a Dr. Chem. Sci. in catalysis from the Boreskov Institute of Catalysis (Novosibirsk). Dr. Bryliakov is a leading research scientist at the Boreskov Institute. He has co-authored more than 90 papers, book chapters, and patents. His research interests include transition metal-catalyzed asymmetric oxidations, single-site olefin polymerizations, and mechanistic aspects of those transformations.